This stylish Madrid style hat is all you need to keep looking good and feeling cool all summer. 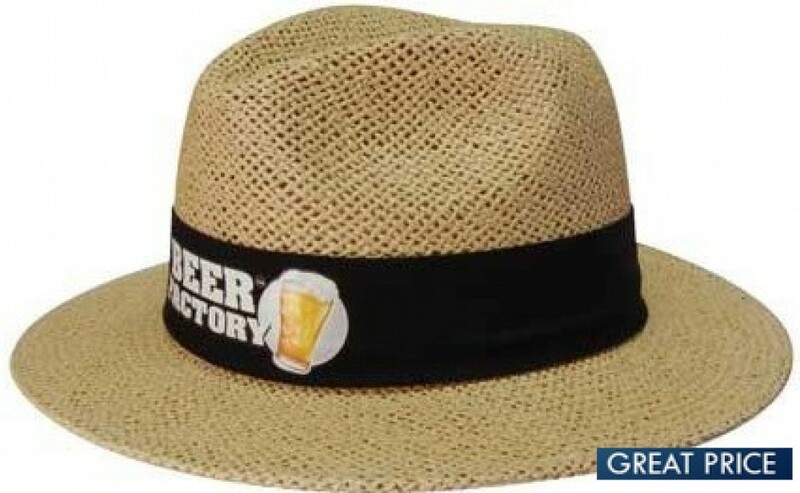 While most Madrid style hats are all straw, this one comes with a layer of fabric under the brim, for that extra sophisticated European style look and an extra layer of sun protection. This hat has a loose weave, so you have an airy design that will help keep you cool. It comes comes in a natural straw colour, but ask our sales staff about a choice of hatband. It is offered in two sizes - S/M and X/XL. This is a hat that is a great option for any man or woman. We embroider or print your logo onto hatbands on these attractive and sophisticated hats. These make great branded sales items for resorts, hotels, beachfront businesses, and any sort of business whose customers will appreciate a classy style and sun protection. They also make excellent hats for clubs, teams or other organisations that spend a lot of time in the sun - and want to look good when they do so. These hats come with 8000 stitch count of embroidery. Ask for pricing information on other branding options. Please provide your branding artwork in eps, pdf or high-resolution jpeg format. The listed prices exclude GST and delivery costs. Ask about our digital mock-up service for a look at what your finished hats will look like after they've been produced.